Since, as Reuters reports, clashes between Kurdish and Syrian forces have intensified. 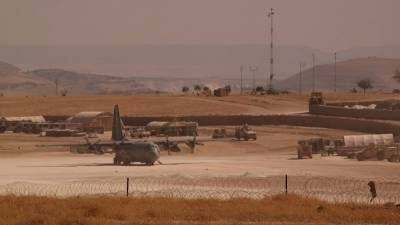 A number of analysts previously forecasted that the US would take this route given the success of the Syrian and allied Russian campaign in general and in particular in light of souring US-Turkish relations, the possibility of the US losing access to the Turkish Incirlik base, and the dire situation of Takfiri forces holed up in Aleppo. Different international news agencies have already run a version of the story which presents the US forces’ communique as a “warning for Russia and Syria” (CNN) or a “defensive threat” (IBT), but they have failed to distinguish the de facto meaning of this development. Nor have they included that the US military’s official statement is in stark violation of international law, constituting an illegal occupation of a sovereign state. It has long been assessed that the reason that the US had simultaneously backed ISIS and Kurdish forces was for the purpose of using ISIS as a “place holder” to be defeated, either virtually or in actuality, only to then carve out a US occupation zone under the pretext of forming an independent Kurdish state. Previously last year, representatives of the Kurdish autonomous region made an unconstitutional and unilateral announcement of federalization. This turn was used to create a seemingly legal ambiguity, or ‘gray area’, to confuse public discourse at the media level. However, the anti-terrorist coalition’s foreign ministers as well as international legal experts are under no illusions that the unilateral declaration of federalization is just as much a violation of Syrian sovereignty as would be a breakaway republic made possible only thanks to a war of US occupation. Under the international legal norms of the Geneva convention as well as subsequent parallel agreements, a foreign occupying country does not have the right to divide, separate, occupy, or carve out a section of a country regardless of what the occupying army terms such as. 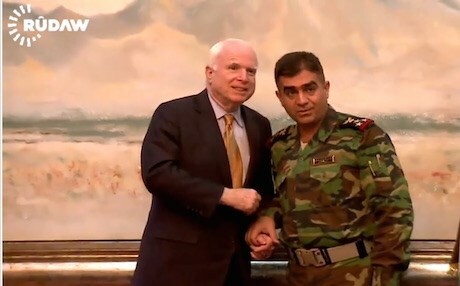 Moreover, the most recent communique from the US Lt. General Townshend in Northern Syria laid out plans to increase the area of what the US considers “Kurdistan.” Under the present Syrian Constitution, Kurds are represented both in the government in Damascus and have a semi-autonomous status within the central Syrian state. 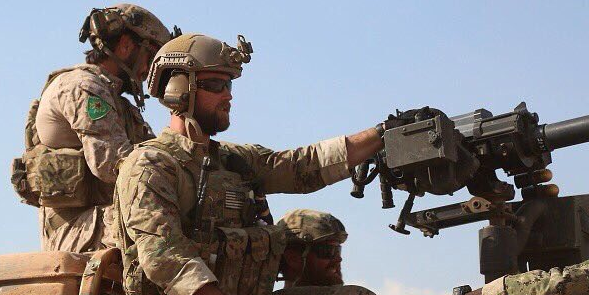 The brazen and illegal warnings issued by the US commander pose the real possibility of creating a direct confrontation between Syrian, Iranian, Russian, and other independent forces on the one hand, and the US military and their Kurdish puppet outfits on the other. This dramatic increase in hostilities would deal a major blow to hopes for a diplomatic resolution to the crisis. In 2011, the US, alongside its Israeli, Turkish, Qatari, and Saudi allies and with assistance from Jordan, organized, sponsored, and financed the launch of an illegal invasion by non-uniformed regular soldiers, mercenaries, child soldiers, and armed religious fanatics (many of whom themselves were shipped into the region from Europe where they have legal residence). A 2011 protest movement which had blossomed out of the efforts of the US National Endowment for Democracy and UN-sanctioned NGO’s financed by the House of Saud and Qatari monarchy took advantage of Syria’s liberal and open society, infiltrating civic organizations and manipulating Syria’s secular pluralism against itself. This created the possibility for a media simulacrum in which international observers and media, both intentionally and unintentionally, conflated a protest movement comprised mainly of Syrians with a military operation which very quickly became nothing more than a foreign invasion. Russian involvement upon the invitation of the legitimate government of Syria was the source of a serious setback to US aims in the region. Now what remains to be seen is what the US is actually prepared to do. Syrian and Russian military planners no doubt long ago gamed out multiple scenarios and developed some kind of responsive contingency plans. It is only natural that, while such responsive plans exist, they would not be a matter of public disclosure. At issue is the capacity of the US, a once global hegemon which geostrategic analysts around the world have assessed to now be in a waning phase, to maintain an occupational foothold in the Kurdish region of Syria. Both Syria and Turkey may find that they have a common interest in opposing a US puppet Kurdish state. Prior to the outbreak of the present conflict, Syria and Turkey maintained a treaty which allowed Turkish security forces to pursue Kurdish separatist terrorists who would at times flee to Syria from operations in Turkey. After the conflict began, both Syria, and Turkey and the United States (to the extent to which the latter two can be considered to have divergent interests) all engaged in the game of playing the Kurdish card. Each side in the conflict hoped to be able to use the support of armed Kurdish groups to their own ends. While there is much information that suggests that Turkey is in the process of reorienting itself away from Euro-Atlanticism and NATO, especially in light of Turkey’s moves during and after the failed coup attempt, there is always the possibility that recent Turkish moves are actually part of a long term plan to cast a specter of uncertainty over Turkey’s future plans in concert with the US. Such would not at all be unprecedented in the history of geopolitical alliances. In conclusion, the US’ announcement marks a turning point in this conflict. If before there had been any ambiguity about the US’ intentions in Syria – a plan to divide Syria which had been publicly elaborated in numerous pro-Atlanticist think tank publications such as those of the Brookings Institute or Council on Foreign Relations – then now the US has revealed its hand. This is a historic and dangerous development which only increases the chances of total war. All images, except the featured image, in this article are from Fort Russ.